Our client is a provider of Operational Analytics and Visualization solutions for cloud/datacenters that enables IT function of an organization to monitor, and plan complex cloud and data center environments. Our client’s operational analytics solution provides near real time correlation, analytics and visualization across legacy and modern NFV, SDN and OpenStack environments. It is focused on end-to-end monitoring of the hardware and software infrastructure through automated correlation within short time and few resources as compared to any traditional mechanism. Today datacenters are top priority when it comes to IT infrastructure requirements. Datacenters are now seen as a key business parameter, and not as an external facility for storage of information and business operation models. Any interruptions in datacenter operations can have a big impact on the company. Datacenters generate huge amount of data that included networking events, syslogs, device logs, server logs, application logs etc. 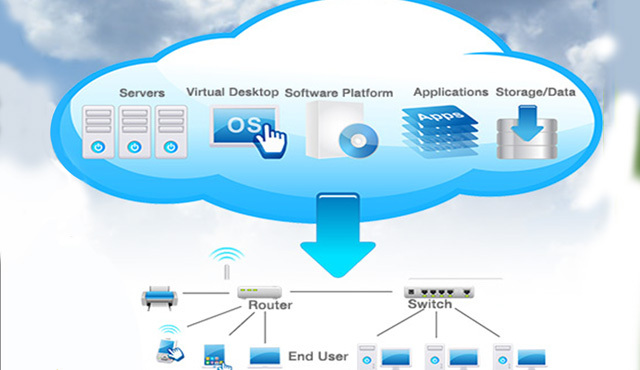 which are imperative for the clients businesses as any downtime would cost in terms of revenue and business. Our client realized that they need a next-generation infrastructure monitoring software that enables operations personnel to perform end-to-end monitoring of their software and hardware systems running in a datacenter or cloud. This software would automate monitoring process of products for various parameters such as memory usage, CPU usage, disk usage, Java Virtual Machine and other related parameters. In any case parameter reaches a defined threshold value, an alert would be raised for the user to take precautionary and preemptive actions. This in turn could save data center downtime which would result in financial savings on business processes as well as facilitate decision making. Build a standards based monitoring system with APIs to fetch runtime values from various sources like software servers, databases, and applications. Develop a mechanism for performance monitoring of networking and storage components. Implement a rules engine that would perform correlation for various metric parameters such as Memory, CPU, Disk usage etc. Build a system that can easily incorporate new hardware and software with minimal configuration / customization. Key challenge for developing the application was absence of single monitoring software that can provide a unified view of the datacenter. As unified view was not available, it was difficult for operations personnel to visualize the storage and networking topologies along with the installed hardware and software components. A team of subject matter experts (SME’s) along with developers at Xoriant worked in sprints as an offshore-onshore delivery model. Development and implementation of monitoring component API’s to identify, fetch and monitor runtime parameter values from products for monitoring parameters. Designed a generic framework to cover a range of infrastructure components like networking devices, servers, storage devices and applications with minimal development time. Development of components was done in a way that most of the development efforts go into common framework instead of specific product lines thus reducing testing efforts, and thereby making it viable to add several devices, etc. 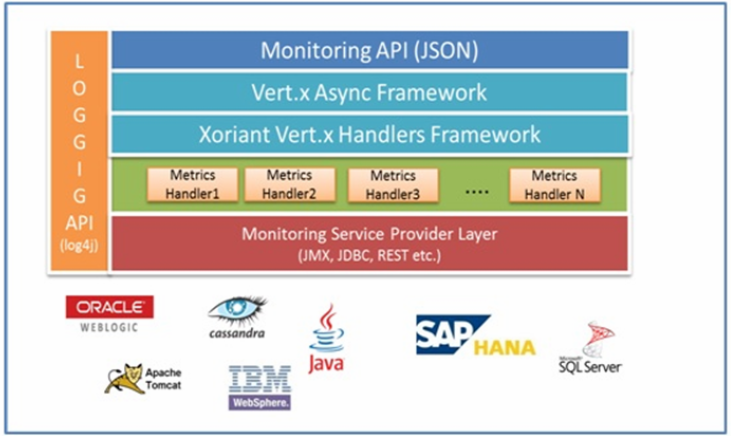 Developed monitoring components and API’s using Java standards such as Java Management Extensions and Java Database Connectivity. Designed and implemented key performance indicators (KPIs) tracking tools like Apache-Cassandra, Weblogic. Defined metric to capture key health indicators and acceptable threshold values/range for each health indicator. Implemented an on-screen alert generation functionality based on the metric data and acceptable threshold ranges/values metadata stored in MySQL datastore. Built monitoring component with the required visualization by retrieving software component details related to General Information, Metric Definition, Accessing Metric Data, Accessing Event Logs, and Alert Generation. On-screen alerts functionality was incorporated in the system for the users. Implemented Vert.x framework as a message bus for distributed communication across the platform in the form of events and event handlers. Ensured business continuity through product monitoring system eliminated manual management of parameters for prospective hardware and software failures. Reduced system outages by 23%. Improved productivity of IT staff by 35%. Reduced capital investment in IT infrastructure monitoring by 30%. Improved financial savings on business processes as well as decision-making owing to minimal datacenter downtime. Enhanced system flexibility by incorporating connection pools for various data sources. Centralized management system ensured secured and controlled access to the data, no data leaks and improved mean time to repair. Reduced capital investment in IT infrastructure monitoring by 28% by developing a next –gen end to end infrastructure monitoring software which performs monitoring for relational and NO-SQL database servers, web application servers, networking and storage products running in cloud.